Semi-trucks are ubiquitous on Georgia’s busy roadways. Driving alongside a large truck, however, is bound to cause anxiety in drivers of smaller vehicles. Their sheer size, massive weight, slower rate of speed reduction, and the challenges drivers face in maneuvering them, all point to truck accidents being more likely to lead to severe injuries. While many truckers are responsible and seasoned drivers, other drivers should still be mindful of trucks and drive with caution. 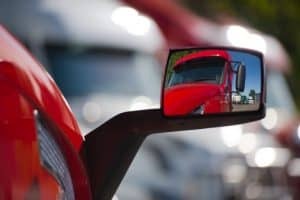 One of the most important things to know when driving near a large truck, or even a bus or other oversized vehicle, is to stay out of their blind spots. Although we all have them in our cars, large trucks have greater blind spots that increase the chances of an accident. The most important takeaway is that if you cannot see a truck’s side mirrors then they cannot see you. Everywhere else is a blind spot—they do not have the luxury of rear-view mirrors and back windows to improve their visibility. You know you are in the danger zone if you cannot see your reflection in their mirror. Remember to always be patient when sharing the road with larger vehicles. Additionally, do not get too close to a truck when it is turning. Some trucks need such a wide berth, they require an additional lane to make a turn. Give yourself even more time and distance when driving in poor weather conditions. Even the most cautious drivers are at risk of being struck by a commercial vehicle. The Georgia trucking accident attorneys at Harris Lowry Manton LLP have decades of experience helping injury victims obtain full and fair compensation. To arrange a no-obligation consultation, give our firm a call at 404-998-8847 at our Atlanta office, or in Savannah at 912-417-3774, or complete our contact form.